A former coaching inn dating back to the early nineteenth century, the Swan & Royal’s most famous former guest is surely Mahatma Gandhi. Visiting in 1933, he used the hotel as a base while visiting a nearby cotton mill (information from which he would later take back to India and use to good effect). The inn also played host to Sir Winston Churchill between 1940 and 1941 while the Prime Minister was visiting the nearby factory of jet engine pioneer, Sir Frank Whittle (another famous guest). Following a major fire, the property underwent restoration and re-opened in February 2011. Its 6 guest rooms are all named after figures connected with the place, and include the Gandhi Room, Sir Winston Churchill Room, and the Sir Frank Whittle Room. 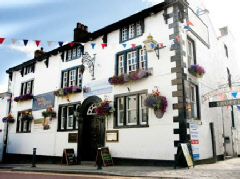 Interestingly, the Swan and Royal is also the starting point for weekly ghost walks around Clitheroe. Located close to the town’s railway station, it is also within easy reach of Preston, Blackburn and Burnley.